Nebraska has no shortage of places to grab a delicious, sugary treat. From handmade chocolates to hundreds of flavors of licorice, these top shops in the state carry everything a candy lover could dream of. 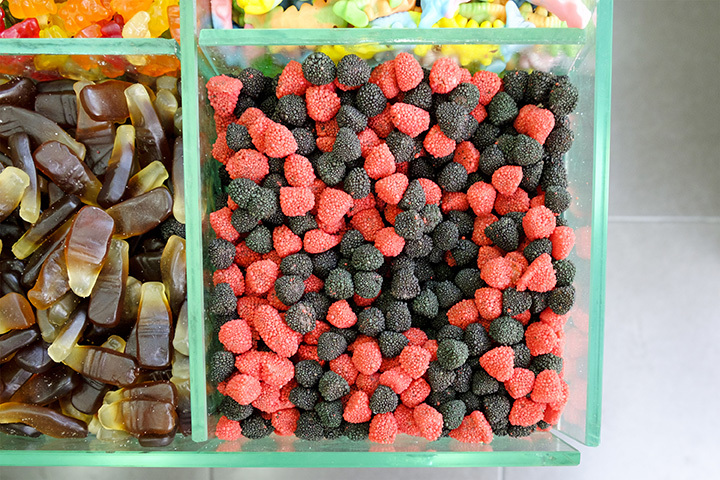 If you’re craving something sweet, then check out these 10 best candy shops in Nebraska. Since 1977, Old Market Candy Shop has been the place to find homemade chocolates, fudge, and retro candy in Omaha. For all the sweets that remind you of your childhood, don’t miss this excellent local favorite. The official home of Nebraska’s famous chocolate meltaways, Bakers Candies in Greenwood has been proudly producing chocolate for generations. If you’re between Omaha and Lincoln, be sure to stop at the Bakers Candies factory for a chocolate fix! For handcraft confections, fudge, caramel apples, and delicious gourmet popcorn, check out Candy Wrappers in Omaha. You’ll be sure to walk out with a delicious treat and a satisfied sweet tooth. Hollywood Candy in downtown Omaha is the ultimate destination for candy lovers. Candy covers the shop from floor to ceiling, so you’ll be sure to find your favorite candy here. From retro candy, PEZ, to homemade fudge, Hollywood Candy has it all. Chocolate lovers—this is your place. Upon entering the Chocolaterie Stam in Papillion, you’ll be greeted with the delicious smell of espresso and chocolate treats. Treat yourself, or customize your own gift box of chocolates for someone special. This Lincoln candy shop sells over 160 different types of licorice from 12 countries. Fine chocolates and other delicious candies are also available so if you’re in the mood to try a sweet treat you’ve never tried before, then make your way to Licorice International. These chocolate-covered cherries are like nothing you’ve ever seen before. Each cherry is covered in delicious chocolate and hand-decorated with beautiful designs. Cordial Cherry’s creations have even been featured in Oprah magazine. The Chocolate Bar in Grand Island goes beyond a typical candy shop. It’s also a bakery with a focus on chocolate treats. From artisan chocolate candies to truffles, The Chocolate Bar will put you in a chocolate coma. Serendipity Chocolate Factory is a sweet, off-the-beaten-path chocolate shop located in Tekamah. Delicious dark, milk, and white chocolate treats are all available and truly handmade works of art. Located inside the Conestoga Mall in Grand Island, The Incredible Bulk is a sugary utopia. Sweet treats are available in bulk or wrapped forms, so be sure to stop in and discover its wonders.